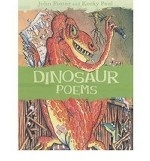 Аннотация к книге "Dinosaur Poems"
A collection of poems about one of children`s favourite subjects - dinosaurs. Including the Stegosaurus, Tyrannosaurus Rex, the Bookoceros, together with dancing dinosaus and dinosaurs having a party. Korky Paul`s lively illustrations to life this popular poetry book. John Foster and Korky Paul`s poetry partnership began over 10 years ago, with the publication of Dragon Poems. The combination of John`s inspired and witty selection of poems, with Korky`s crazily imaginative and anarchic illustrations, has proved exceptionally popular. `If this combination of verse and illustration doesn`t make you laugh out loud, then you must have missed out on the sense of humour gene` The Guardian A must for the classroom or library. No child could fail to find enjoyment here` Brian Moses.